Staying at Branson log cabins allows guests to enjoy a wonderful new year’s vacation as these cozy accommodations at Grand Mountain are fully furnished that can make you worry-free about anything. Nestled along the rolling hills of the Ozarks, the furnished log cabins at Grand Mountain provide the best accommodation experience in a secluded place but actually near the heart of Branson. Since the beginning of the offerings of these comfy log accommodations, the staff and managers have been dedicated in providing luxury cabin experience as the numerous awards and testimonies will attest. Branson log cabins at Grand Mountain are some of the best choice for first time visitors as they get wowed by what the repeat visitors have already experienced. These cabin accommodations are truly the most preferable means of lodging for any type of vacation. With its beautiful location in a calm environment, you will know that a perfect and worryless new year’s vacation is waiting right here – the beauty of nature, unspoiled scenery, the clean waters of the three pristine lakes, bountiful wildlife, and exciting activities and great water adventures you can count on. The gorgeous log cabin accommodation at Grand Mountain is dedicated to taking the rustic natural cabin experience but actually tucked into the heart of the legendary live entertainment district in Branson. Guests staying at the cozy log cabin accommodations are rest assured that the traditional respect and hospitality in the Ozarks will be on full display when you spend a wonderful new year’s vacation at Grand Mountain or play nearby with the award winning 18-hole golf course at Thousand Hills Golf Resort. Considered as the most popular and highly awarded golf course in town, the course assures you to receive preferential tee times and green fees. Two Bedroom Loft Branson Log Cabin at Grand Mountain is another cozy accommodation which can provide you also a wonderful new year’s vacation. These log cabin accommodations are just one of the many lodging options at Thousand Hills Golf Resort, and are perfect for a family that needs the space that regular hotels can’t provide. Additionally, every log cabin unit is individually decorated so that no two cabins come out exactly the same, and still has all the luxury and convenience that guests expect at the resort. 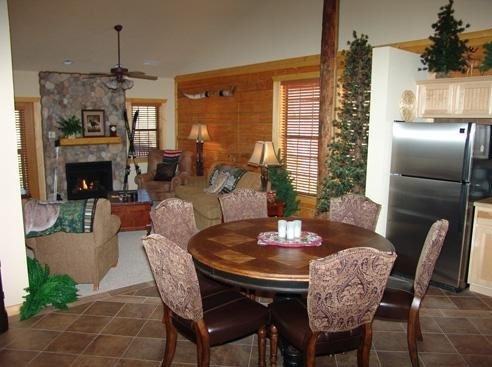 With the log cabin’s spacious area of around 1450 square feet, it can comfortably accommodate a family of 8. Whether you stay at one-bedroom log cabin or two-bedroom log cabin at Grand Mountain, each living room has all the comforts of home including a sofa sleeper, free wireless internet access, TV and DVD player, and access to a screened porch overlooking the wooded valley of Branson. Meals can easily be prepared as every unit features a fully furnished kitchen complete with appliances such as fridge, microwave oven, dishwasher, pots and pans, kitchen wares and utensils and more. So, if you are planning to spend a worryless New Year’s vacation, don’t hesitate to stay at the cozy log cabin accommodation at Cabins at the Grand Mountain.